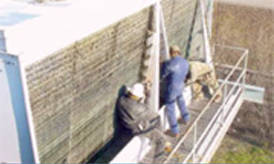 Huneke Associates has been solving mechanical problems since 1986. A privately held woman owned small business, we are dedicated to providing quality, cost effective solutions to machinery maintenance. Recently, a large plastic bottle manufacturing plant was scheduled for plant shutdown. 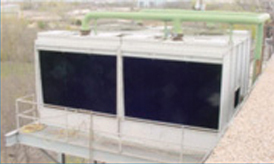 During this shutdown, three Series 3000 cooling towers were to undergo major overhauls which would include repairing & coating the cold water pans and replacing the fill. Due to production considerations, all work had to be completed in 36 hours! And the next scheduled shutdown would not occur for another year, so the job had to be done right the first time! After discussing the options of glued bundles, the original fill, and a VersaCross™ Replacement Fill kit with BAC and Huneke Associates, the owner chose VersaCross™ based on the following reasons: 1) Shipment in 2 weeks or less – compared to 4 to 6 weeks. 2) Complete pre-engineered kit with all supports, hardware, and instructions. 3) BAC promise of increased thermal performance. 4) Quicker installation time and low total cost of materials & labor. Huneke Associates was prepared to work around the clock with a crew size of 3-4 men per cell. But, by dinner time the first day the existing fill had been removed, the towers were cleaned, inspected, & corrosion issues were addressed, and the new VersaCross&trad; fill supports were already installed. The only thing left to do was install the fill. In fact, the job was so far ahead of schedule, the crews were sent home for a good night’s rest! Work resumed the following morning at 7:00 am. The fill was quickly installed and the towers were in operable condition by noon! The owner was back in production as scheduled and we had generated great savings against his projected budget. Another successful installation by Huneke Associates.